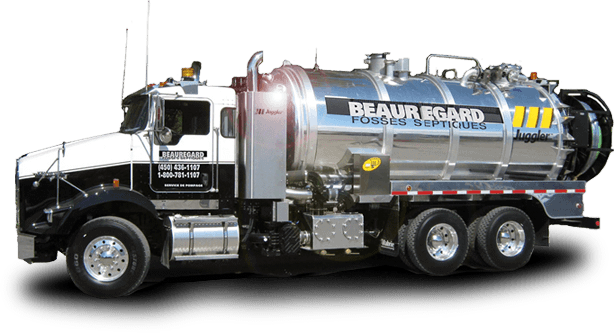 At your service for more than 40 years, Beauregard Fosses Septiques is the specialist in septic tank cleaning and maintenance on the North Shore and in the Lower Laurentians. a weekend package nearly valued at 400$. 1st August 2016 ***NEW SERVICES*** We now offer commercial service for the pumping, cleaning and unblocking of cesspits, pumping stations, thawing of drains and much more. These services will be added to our website shortly. We look forward to serving you! 365 days a year ! Beauregard Fosses Septiques offers emergency service 7 days a week, 365 days a year. If you are having problems with your septic tank, call us immediately at 1.800.781.1107. We will quickly dispatch a qualified technician to evaluate the situation and provide you with the appropriate service to resolve the problem. Our clients our mainly located on the North Shore and in the Lower Laurentians. We serve the following municipalities; Laval, Mirabel, Ste-Thérèse, Terrebonne, Mascouche, Lachute, St-Jérôme (Ste-Sophie, St-Lin des Laurentides, St-Calixte, Mirabel, St-Colomban, Prévost) and surrounding areas, Richmond’s territory and surrounding areas. Beauregard offers you the best service… at the best price! Our goal is to offer you the best possible service. Contact Beauregard Fosses Septiques for the emptying of your septic tank. Our experienced technicians our courteous and professional. They have the necessary knowledge to provide efficient and prompt maintenance of your septic tank. We offer special rates for groups and associations.